Through the generous support of the McFarlane family, DSACO will be offering microwave based cooking classes for teens and adults with Down syndrome. The classes are meant to teach and encourage independent living skills while having fun and filling stomachs. Students in the class will be creating a side dish, main dish, or dessert that can be easily replicated at home. 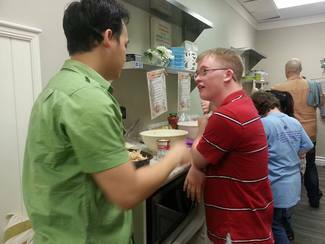 Volunteers will help teens and adults with Down syndrome complete the week's recipe. Please only sign up if you are CERTAIN you'll be able to attend!